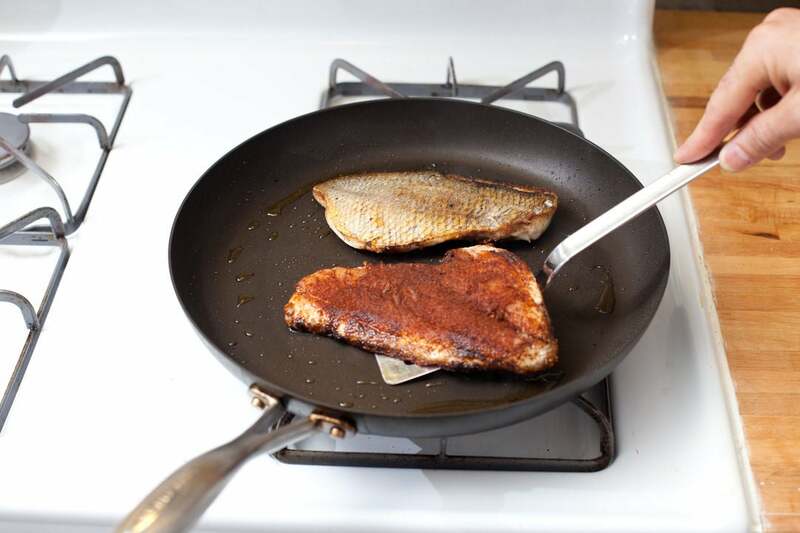 There are about 15 different species of fish known as porgy, and most of them can be found off the Atlantic coast of the U.S. It’s a flaky, white fish with a mild, sweet flavor, best when seared in a hot pan, like in this recipe. 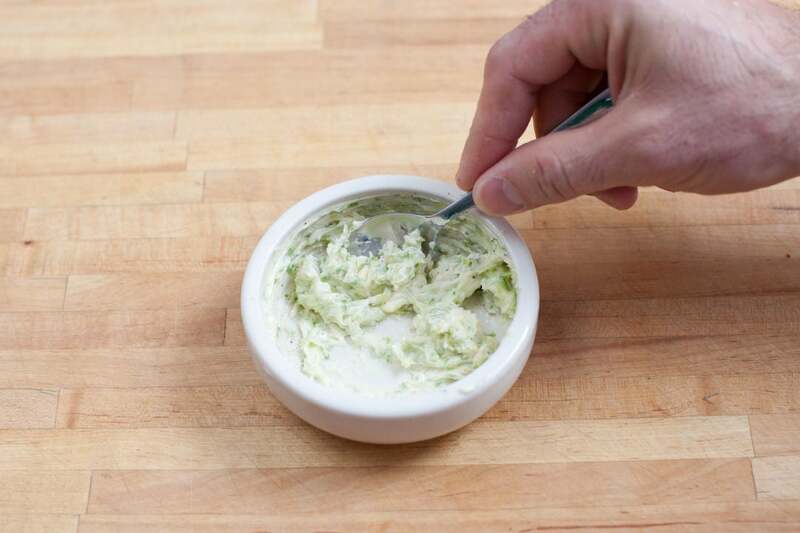 Since citrus is a natural accompaniment to fish, we used lime to create a compound butter (a butter mixed with other ingredients and served as a pat or dollop to finish a dish), to add some zing. Heat a medium pot of salted water to boiling on high. Take the butter out of the refrigerator and allow it to soften at room temperature. Wash and dry the fresh produce. 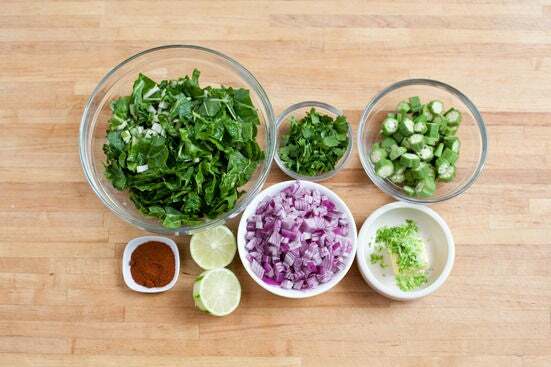 With a knife or vegetable peeler, remove the green peel from the lime. Finely chop the peel to make lime zest. (You can also use a citrus grater to do this.) Add the zest to the butter along with a pinch of salt. Peel and small dice the onion. Roughly chop the cilantro. Trim the ends of the stems off the Swiss chard then thinly slice the rest of the stems and the leaves. Slice the okra into rounds, discarding the stems. 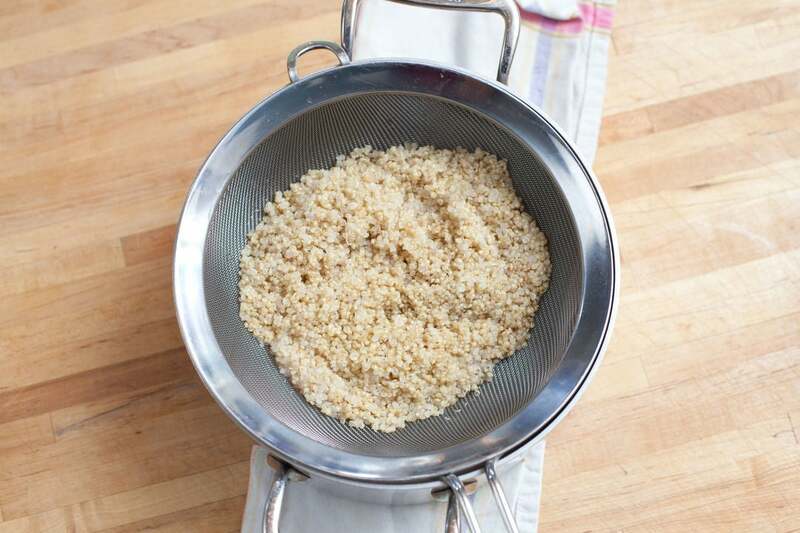 When the water comes to a boil, add the quinoa and cook 10 to 13 minutes, or until tender and cooked through. Drain well. 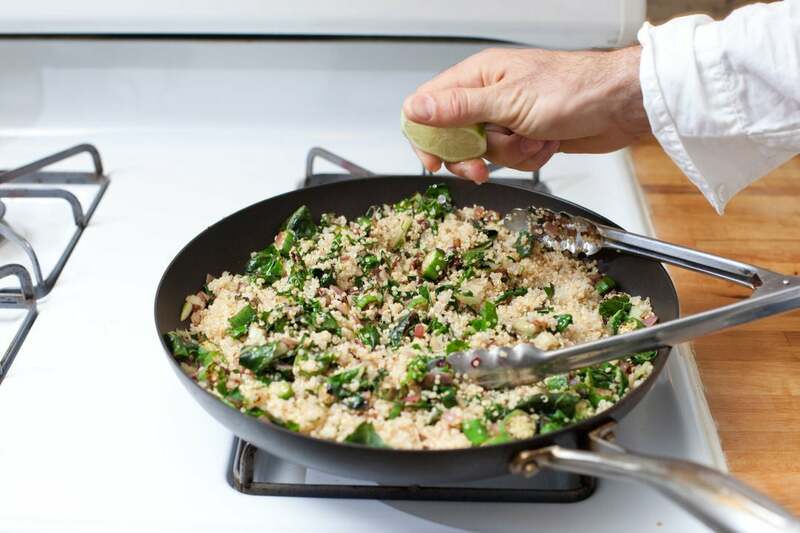 After cooking the quinoa for about 5 minutes, heat some olive oil in a large pan on high until hot. Add the onion and okra and cook 2 to 4 minutes, or until softened and lightly golden, stirring occasionally. Season with salt and pepper. Add the chard and cook about 2 minutes longer, stirring until the chard is completely wilted. 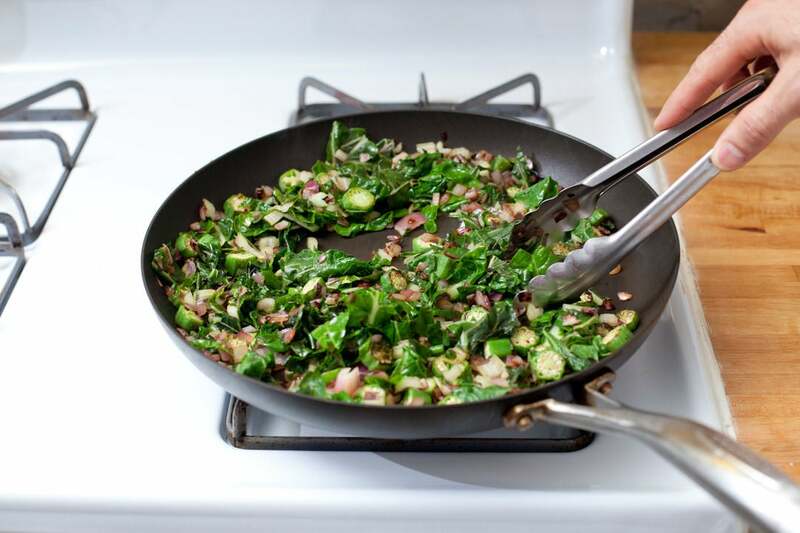 Stir the cooked quinoa into the vegetables in the pan. Squeeze the juice of half the lime into the mixture and stir to combine. Season with salt and pepper to taste. Transfer the mixture to a bowl. Pat the fish dry with paper towels. Sprinkle the non-skin side with some salt and the ancho chili powder. Wipe out the pan used for the vegetables and use it to heat some olive oil on high until hot. Add the fish to the hot pan, skin side down, and cook 3 to 4 minutes per side, or until cooked through. While the fish cooks, add some pepper to butter with lime zest and stir until combined. Divide the vegetable quinoa between 2 plates. 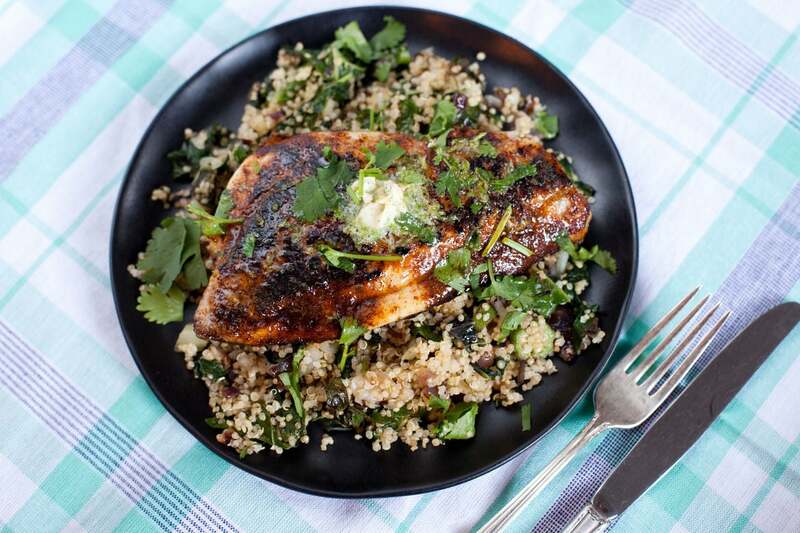 Top each plate of quinoa with a piece of the fish. 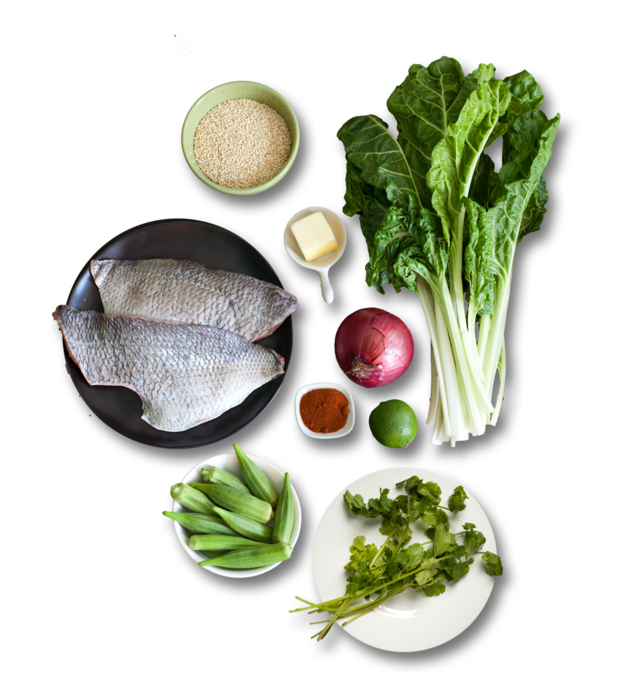 Place a dollop of the lime butter on top of each piece of fish. Garnish with the cilantro and lime wedges, if you like. Enjoy!